We take pride in our long-standing tradition as hunters to take a proactive role in wildlife conservation and management, and we recognize those who have already taken action. We invite other hunters and hunting organizations to join the newly formed North American Non-Lead Partnership (NANP) in providing factual information to their hunting community that best serves our wildlife conservation and hunting heritage. Partners - The Peregrine Fund, Oregon Zoo, Institute for Wildlife Studies, Arizona Game and Fish Department, Utah Division of Natural Resources, and the Oregon Department of Fish and Wildlife. Lead is a poisonous metal present in a variety of commercial products, as a pollutant from industrial activities, and as an environmental contaminant in many urban and rural habitats throughout the world. When ingested or inhaled, the body "mistakes" lead for calcium and other beneficial metals, and thus transports lead into nerve cells and other vital tissues. Mankind has long known about lead as an agent of sickness and death, but medical studies published in the last five to ten years are showing harmful effects at unexpectedly low levels of exposure. There are permanent adverse impacts upon cognitive function and growth in children with histories of blood levels averaging less than one-tenth of one microgram per gram—a level formerly considered benign. Scientific evidence of the effects of lead on human health has brought forth large scale restrictions on its use in the United States, including the prohibition of lead in many gasolines and paints. Responses on behalf of wildlife have been less forthcoming, but consumption of lead shot by ducks and geese and secondary poisoning of Bald Eagles contributed to the 1991 ban on lead shot for waterfowl hunting in the United States. Other countries have instituted similar measures. — See the complete preface for references and citations. The preface is from the proceedings of the 2008 conference, Ingestion of Lead from Spent Ammunition: Implications for Wildlife and Humans. 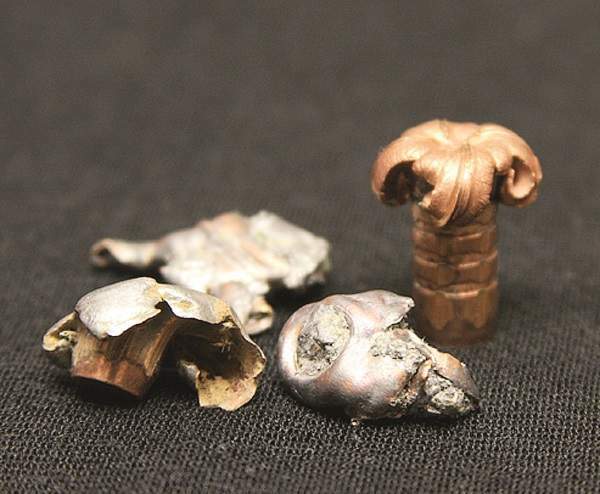 Solid copper bullets (far right in above photo) retain nearly all of their original weight.